The task of designer ships, which are increasingly fuel efficient as well as environmentally friendly, is the marine industry's constant challenge, today and forever. While hull designs and propulsion systems continually evolve, a new development from Knud E. Hansen A/S shows promise in taking the cause a step further. An interesting design being touted by the firm is a Modern Windship. a sail-assisted vessel, which marries Mother Nature's power harnessed with an innovative ship shape. In fact, according to the designer, the new efficient rig design, combined with an especially developed underwater hull, promises to cut the fuel consumption by half on selected ocean routes. In 1995 the Danish Ministry of Environment and Energy granted funding for Knud E. Hansen A/S to investigate the feasibility of adding sail assisted power to propel commercial ships. In phase 1, which was finished in November 1996, a broad background of various projects from the last 30 years, involving sailing and sail assisted ships, were investigated. The study envisaged a new type of sailing vessel named "Modern Wind- Ship" with a length of about 656 ft. (200 m) and a dwt of 50.000 tons. 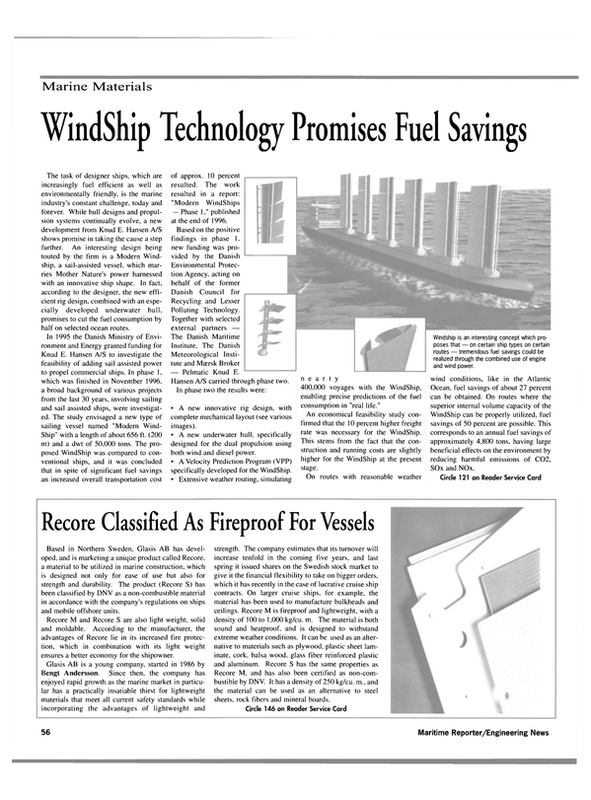 The proposed WindShip was compared to conventional ships, and it was concluded that in spite of significant fuel savings an increased overall transportation cost of approx. 10 percent resulted. The work resulted in a report: "Modern WindShips — Phase 1," published at the end of 1996. Based on the positive findings in phase 1, new funding was provided by the Danish Environmental Protection Agency, acting on behalf of the former Danish Council for Recycling and Lesser Polluting Technology. Together with selected external partners — The Danish Maritime Institute. The Danish Meteorological Institute and Mtersk Broker — Pelmatic Knud E.
Hansen A/S carried through phase two. In phase two the results were: • A new innovative rig design, with complete mechanical layout (see various images). • A new underwater hull, specifically designed for the dual propulsion using both wind and diesel power. • A Velocity Prediction Program (VPP) specifically developed for the WindShip. • Extensive weather routing, simulating n e a r l y 400,000 voyages with the WindShip, enabling precise predictions of the fuel consumption in "real life." An economical feasibility study confirmed that the 10 percent higher freight rate was necessary for the WindShip. This stems from the fact that the construction and running costs are slightly higher for the WindShip at the present stage. On routes with reasonable weather wind conditions, like in the Atlantic Ocean, fuel savings of about 27 percent can be obtained. On routes where the superior internal volume capacity of the WindShip can be properly utilized, fuel savings of 50 percent are possible. This corresponds to an annual fuel savings of approximately 4,800 tons, having large beneficial effects on the environment by reducing harmful emissions of C02, SOx and NOx.